Based on the cult 1950s monster movie, Creature from the Black Lagoon is a 5 reel, 20 payline video slot from Net Entertainment. This film-themed game comes with sticky and spreading wilds, re-spins and a bonus feature that awards up to 30 free spins. Play from between 20p and £100 per spin. 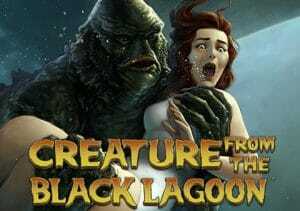 Creature from the Black Lagoon is a typically well-designed game as we’ve come to expect from NetEnt – the setting is a beautiful looking lagoon, flanked by lush, green vegetation. Symbols on the reels include objects you’d find in an explorer’s backpack such as knives, cameras, oxygen tanks and binoculars. The higher value symbols are comic book style characters from the film – Lucas, Carl, David and Kay. Land 5 of Kay on 1 of the 20 paylines and a payout of 750 coins will be heading to the cashier. The Creature from the Black Lagoon logo is the game’s wild. Whenever 1 lands, it will remain frozen in place and a re-spin will follow. If you get more wilds, you will continue to get re-spins until no new wild symbols remain anywhere on the reels. The bonus action centres on the unlikely monikered ‘Gill Man’, who is the mystery beast from beneath the waves. In the Free Spins feature, the goal is to rescue Kay from the clutches of this mysterious creature. To trigger the feature, you’ll first need to land 3, 4 or 5 free spin symbols which will get you 10, 15 or 20 free spins. Level 1 (0-2 collected target symbols) – wilds appearing on the reels become sticky for 1 re-spin. Level 2 (3-5 collected target symbols) – the 1st Spreading Wild is triggered with wilds spreading horizontally 1 position to the left and remain on the reels for 1 re-spin. Level 3 (6-8 collected target symbols) – the 2nd Spreading Wild comes into play with wilds spreading horizontally 1 position on the reels both left and right. They also remain on the reels for 1 re-spin. Level 4 (9 collected target symbols) – this will reward you with 10 extra free spins giving you potentially 30 free spins in total. As you’d expect from a collaboration between NetEnt and movie studio Universal, Creature from the Black Lagoon is a pretty glossy affair, both in terms of design and features. The comic book style visuals work really well and the melodramatic soundtrack gives the action a real B movie feel. The features stack up rather nicely too – the wild re-spins help move things along in the base game but it’s in the Free Spins feature where things can really fly. If you’re successful in your battle with the creature, the spreading wilds with re-spins the coins can quickly flow. There’s up to 750 times your stake to be won on every single spin. We’d never seen the original Creature from the Black Lagoon but if the video slot adaptation is anything to go by, it’s worth a search on Netflix. There may not be untold riches lurking in the waters here but this medium variance game offers plenty of entertainment and is worthy of investigation. For your reference, NetEnt has developed plenty of video slots with Universal such as Scarface and Dracula.